Click Here To See Incredible Hulk #608 Comic book! Check out this SWEET 2010 Marvel cover, which was penciled by the great John Romita, Jr. and inked by the great Klaus Janson, from the story titled: "Endgame!" 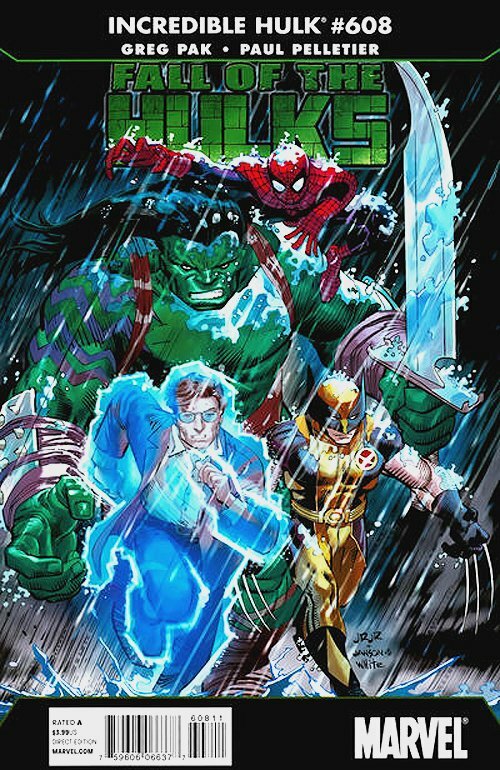 Spider-Man, Wolverine, Skarr (son of Hulk), and Dr. Bruce Banner (in a force field) all charge at the reader in the rain, on this AWESOME COVER! Many find the pairing of JRJR and Janson stylistically very reminiscent of Frank Miller and Klaus Janson. John Romita JR's association with Spider-Man reaches all of the way from his first work on Amazing Spider-Man Annual #11 way back in 1977 at age 21 to well into the 21st Century. He actually received his first credit in an even earlier issue of Amazing Spider-Man, when at the age of 13, he suggested the idea for the Prowler to his famous father in ASM #78! 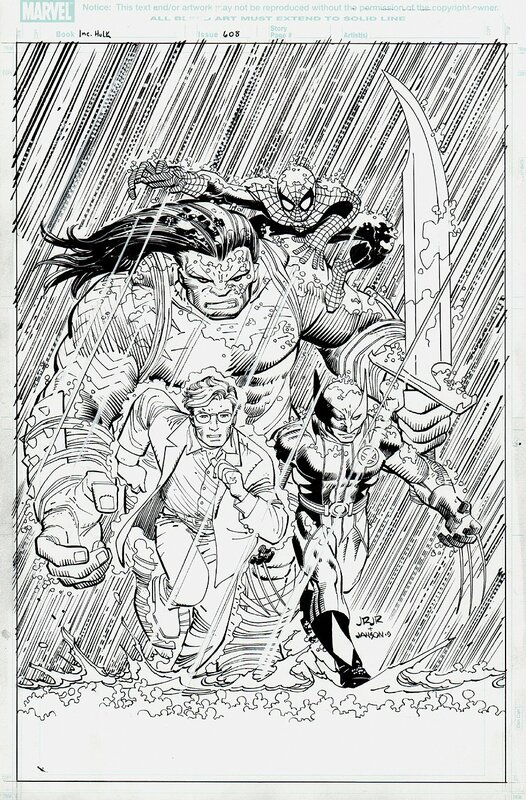 This is a great chance to own a stellar cover from one of the best Spider-Man and Marvel artists of the past 30 years! Compare this nice cover art to the published comic book in the red link above! ALL art on our website (including this one) are able to be purchased with VERY fair time payments, and trades are always considered towards "ANY" art on our website! Just send us an email to mikeburkey@aol.com and we can try to work something out.